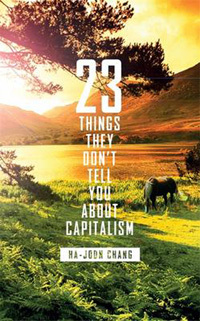 "23 Things They Don't Tell You About Capitalism" by Chang Ha-Joon, professor of Cambridge Univ. A South Korean scholar's book on capitalism "23 Things They Don't Tell You About Capitalism" is praised by foreign media including Britain's Guardian and the Independent. Guardian's John Gray and the Indedendent's Sean O'Grady has recently wrote a detailed and lengthy book review of Cambridge University Prof. Chang Ha-Joo's book, respectively to give readers an insight into the shortcomings of the capitalism. The following are the stories of them. Anxiously defending their turf, many have objected that they never claimed to predict the future. But as Ha-Joon Chang writes: "Economists are not some innocent technicians who did a decent job within the narrow confines of their expertise until they were collectively wrong-footed by a once-in-a-century disaster that no one could have predicted." Far from being an inward-looking, hermetic discipline, economics has been a hugely powerful – and profitable – enterprise, shaping the policies of governments and companies throughout much of the world. The results have been little short of disastrous. As Chang puts it: "Economics, as it has been practiced in the last three decades, has been positively harmful for most people." For those of us disturbed by the way that Bob Diamond, the new boss of Barclays, has, one way or another, made around £95 million from his bank, an institution virtually bust a couple of years ago, Ha-Joon Chang has a couple of "things" to say. Specifically, Thing Number 13 in this myth-busting and nicely-written collection of essays: "Making rich people richer doesn't make the rest of us richer"; and Thing Number 14: "US managers are overpriced." Diamond has spent most of his career on Wall Street, and much the same applies to the UK. Chang gives us the common-sense reason: "Little is done to check excessive and biased (in the sense that failures are hardly punished) executive pay packages because the managerial classes in the US and Britain have become so powerful, not least because of the fat pay cheques they have been getting over the past few decades. They have come to control the boardrooms, through interlocking directorships and manipulation of information," so that "few boards of directors question the level and the structure of executive pay." But haven't we been told that people such as Bob are the wealth- and job-creators, and therefore deserve their vast rewards? And that we thus have to cut public spending rather than tax the rich more to fix the deficit? Not so, because it doesn't work: "Since the 1980s we have given the rich a bigger slice of our pie in the belief that they would create more wealth... The rich got the bigger slice of pie alright, but they have actually reduced the pace at which the pie is growing," arges Chang. American managers earn ten or 20 times the salaries earned by, say, their Japanese or Swiss counterparts, even though the enterprises they lead rarely perform better. In this country, even before the financial crash, the long-term rate of economic growth has hardly shifted from the much-maligned 1960s, even after all those painful, divisive Thatcherite reforms, consolidated by the Major, Blair and Brown governments. You have to wonder whether it was all worth it: the miners' strike, the destruction of manufacturing, the fractured railways, the cult of money and property. Just as the best scientists are those who look at the natural world and want to understand and order its seemingly random and meaningless phenomena, so the best economists are those who look around at our man-made world and ask themselves "why?". Chang is one such. The crucial point he makes is that capitalism doesn't come in one "flavour", and the only reason for keeping any economic system is if it "delivers the goods". One can imagine young Chang growing up in South Korea, wondering about why some families had two cars and enormous houses while others could barely afford their daily rice; or why every Korean high-school student wanted to be a medic; or why Africa was written off as an economic basket case. Or why Korea decided to build a steel industry from scratch, back in 1965. Now Chang is Reader in the Political Economy of Development at the University of Cambridge, and he can explain why. Thing Number 12 they don't tell you is that "Governments can pick winners". The South Korean steel industry is one of the most successful in the world, but it was once regarded as "the worst business s proposition in human history". The mill was far away from the raw materials required to forge steel and isolated from its markets. That, too, was soon solved with a government-sponsored drive to create ship-building and car industries. All that was shortly followed by a similar exercise in electronics. So disturbed was the World Bank at the time that it advised its members to boycott the Korean ventures. The Koreans even had to finance the projects themselves. Far from triggering a calamity, the Korean government's ability to pick successive winners propelled one of the poorest nations in the world into the G20. So next time you hear some minister on TV lazily dismissing the idea that the governments cannot intervene in industry and "pick winners", think about how the Samsung screen you're watching him on came to be in your living room. The best economists are always asking questions like that.